Keeping it a little real on this Christmas tour, you will see my home as seen by my Christmas guests. The dogs' blanket on the chair, and our televisions and television remotes, and a bit of every day life will be visible. This is my junky, rustic front door vignette. My foyer wall is a dark chocolate brown, and my book page Christmas tree from 2012 is situated on a shelf here. Next is a stop in the living room. If you want to see the transformation from a floral sofa to this Surefit slipcover, click here. Here is a vintage vignette with Lefton angels and other figurines on the wash stand. I have a coffee table vignette that is new today on the blog. Made with a chippy green wooden crate, vintage pine cone tray, pine cone tea cup and saucer from Norcrest, books, and pine cones, a faux antler ornament and lights. This is my desk in the living room. This is where I blog. My pug Otis AND the dog blanket are on my chair and a half! Vintage Christmas vignettes on the desk hutch. I have a sparkly, rustic vignette on the dining room table. A silverplate teapot with mercury glass and other beaded picks, Joann fabrics' deer, rustic glitter orbs, a rustic vine and Christmas ball ornaments. Click here for close ups of the stacked Bible Christmas tree on the top of the vintage china cabinet. Now we move on to the vintage toy themed mantel! This was fun for me. I used many of my own vintage toys! See the close ups here. I am still hoping to lose the floral carpeting in 2014 and get hardwood floors! Still waiting for the vintage TV to go too. Here is my small Christmas tree with all of my re-purposed ornaments. A recap and close ups of the ornaments are here. My over the kitchen sink shelf has my framed button tree, my grubby button trees and berry sieve tree. Clipboards and lanterns on my kitchen corner shelves. I painted some flameless timer tealights brown and put them inside the lanterns. On the kitchen door is my re-purposed cake pan snowman. This is my rustic kitchen shadow box. Another kitchen shadow box with painted brass deer, a framed button snowman, and vintage Santa and Mrs. Clause salt and pepper shakers and a Holt Howard Santa mug. Moving on to the den/family room. This room is getting a face lift. It started in the fall of 2013, with a junk gallery wall. Now the junk wall is decked out with a little Christmas decor. This snowshoe shelf is also in the den. A forest of funnel trees are here on shelves in the den. See the close ups here. More vintage vignettes on the bookshelves. A matchbox fire truck from the 1960's. Merryweather, made in England. Primitive mice playing in the snow. A primitive suitcase vignette on my old pew at the end of the bed in the den. Child's chair on the wall for a night stand! I hope you enjoyed the tour! Have a very Merry Christmas my dear readers and followers! What a great tour. Thanks for always sharing your wonderful tour. Have a Merry Christmas. Very interesting Carlene, When do you find time to do it all? Love your Christmas vintage touches, especially the precious little Lefton figurines! The antique toys on the mantle are so cute too. Great tour! love your home, the sparkly vignette and the paper tree is wonderful! Love your vintage Christmas house tour...everything looks great!! Really love the angel that was hanging on the door. LINDO,LINDO,LINDO.AMEI CADA PEDACINHO QUE MOSTROU.UM FELIZ NATAL AMIGA.BEIJO.VALÉRIA. 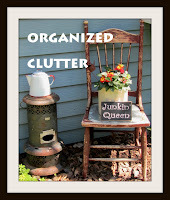 Your house looks cozy and inviting filled with your wonderful vintage treasures, Carlene. I love your collection of vintage angels and ceramic deer! And your berry sieve tree is so darn cute!! I wish you and your family a very Merry Christmas! p.s. I've got the same TV. Wonderful tour Carlene ... so much fun dressing up the collections for Christmas. You do the best job of that and you have so much interesting stuff. I enjoyed your Vintage Christmas tour Carlene. Merry Christmas to you and your family!!! Your home tour is gorgeous. Love all your beautiful rooms. I especially love the vintage fire engine with the tree and little fireman. I need that with my hubby being a fireman!!!! So sweet. Just wanted to wish you a Very Merry Christmas. Awesome tour of your home. Love your pug just hanging out on his chair. Have a wonderful holiday! Fantastic! I love all your treasures. I think you will love mine too. My "house" is open. Come on over to my blog! Merry Christmas! I love it all Carlene! A few things that I had missed. I love the pinecone tray! The bible tree and little fire truck are awesome! Your vignettes are always so creative! I found a bowl with pinecones on it today at a thrift. It's a pattern you see a lot, but thought it would be fun for the after Christmas décor. Your home is comfy cozy! Have a wonderful Christmas!